The article below, published earlier this year in local Augusta, Ga. media, is about a CDMRP-funded treatment target development medical study related to neurological damage in ill Gulf War veterans. The study is essentially a proof of concept aimed at developing treatment targets: that a class of chemicals present in the 1991 Gulf War, organophosphates, could indeed have caused the brain damage found in research on MRI scans of representative samples of the 250,000 ill veterans of the 1991 Gulf War. According to the principal investigator of the study, Dr. Alvin Terry of the Georgia Health Sciences University, "It is expected that the results of these studies will not only contribute to a better understanding of the basis for the neurological symptoms of GWI (the first step before new therapeutic targets can be identified and new treatments can be developed), but also a better understanding of the long-term toxicity of a class of chemicals that continues to pose a significant risk for military personnel as well as millions of civilians worldwide." This particular study looks closely at organophosphates (OP's). Coalition troops were exposed to an array of OP's during the Gulf War, including to sarin and cyclosarin nerve agents following detonations of Iraqi chemical munitions during and after the war, including at the Khamisiyah demolitions, and to an array of Gulf War era pesticides, including DEET, chlorpyrifos, permethrin (a pyrethroid), and others. 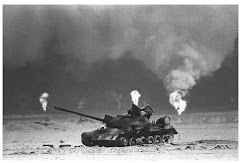 "The extensive body of scientific research now available consistently indicates that Gulf War illness is real, that it is a result of neurotoxic exposures during Gulf War deployment, and that few veterans have recovered or substantially improved with time." Nerve agent protective pills administered to about 250,000 U.S. Gulf War troops (and other Coalition troops -- pyridostigmine bromide (PB) -- have also been implicated by medical researchers in Gulf War neurotoxic exposures. PB is from a class of chemicals similar to OP's, called carbamates. "Many classes of chemicals are neurotoxicants, that is, exposure to these compounds can have adverse biological and physical effects on the nervous system. Three types of neurotoxicant exposures encountered by Gulf War military personnel during deployment are chemically related. They include chemical nerve agents, many of the pesticides used during the Gulf War, and pyridostigmine bromide (PB), the drug given to troops as a protective measure in the event of nerve gas attack." Mustard gas, prominent in the Iraqi chemical munitions arsenal at the time of the 1991 Gulf War including in the Khamisiyah detonations, has also been implicated in Gulf War Illness, including in a 2012 relook at Gulf War neurotoxic exposures funded by the chemical defense arm of the U.S. Department of Defense. Much of the what is known about the long term health effects of exposure to mustard gas was learned following human experimentation at the end of WWII and documented in a government commissioned 1993 report by the Institute of Medicine, part of the National Academy of Sciences. Representative OP's examined in Dr. Terry's study, below, include a surrogate for sarin nerve agent (DFP, diisopropylfluorophosphate) and chlorpyrifos, a potent pesticide used during the Gulf War. Among the variety of chronic symptoms that have been reported in those who suffer from Gulf War Illness (GWI), the neurological problems, especially the deficits in attention, concentration, and memory function, may be the most debilitating. Unfortunately, despite more than 20 years of research, the exact cause of these symptoms remains unclear. It has been hypothesized that a significant contributing factor to GWI symptoms may have been exposure to the class of chemicals known as organophosphates. These chemicals are found in many of the insecticides used in the campaign during the Gulf War, as well as nerve agents. 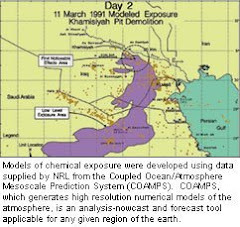 Two nerve agents within the class of organophosphates, sarin and cyclosarin, may have been released into the environment at low levels following the destruction of an Iraqi munitions storage complex at Khamisiyah, Iraq, in March 1991. However, it has been very difficult to determine if exposure to organophosphates, specifically, underlie the cognitive deficits or the changes in brain structure (white matter volumetric changes) that have been recently detected in Gulf War Veterans by magnetic resonance imaging (MRI). The uncertainty arises because of the wide variety of other possible contributing factors (multiple vaccinations, treatments with drugs like pyridostigmine bromide, exposure to smoke from oil well fires, infectious organisms, etc.). Accordingly, one goal of the proposed studies is to determine in animals if exposures to organophosphates at levels that do not cause acute symptoms of toxicity (i.e., similar to the situation with Gulf War soldiers) indeed result in changes in the brain that have been documented by MRI studies in Gulf War Veterans. These types of prospective studies can only be conducted in animal models. We have already published several studies in animals showing that such exposures to organophosphates can result in prolonged deficits in cognitive function. In addition, the diverse and chronic nature of the neurological symptoms of GWI suggests that some basic or fundamental neuronal process was adversely affected while these individuals were stationed in the Persian Gulf area. In previous work we have shown that one such fundamental process, axonal transport, the mechanism whereby important molecules are transported in nerve cells, is impaired in peripheral nerves of animals previously exposed to organophosphates. Our next objective is to determine if axonal transport is impaired in the brains of living animals after exposure to organophosphates, establishing a plausible explanation for the variety of neurological symptoms observed in sufferers of GWI. We have developed the capabilities to investigate each of these phenomena (white matter volumetric and structural changes as well as axonal transport) in the brains of living animals using two magnetic resonance imaging techniques, diffusion tensor imaging (DTI) and manganese-enhanced magnetic resonance imaging (MEMRI). We will study the effects of several doses of a representative organophosphate insecticide that was used during the Gulf War, chlorpyrifos, and a representative nerve agent, diisopropylfluorophosphate. It is expected that the results of these studies will not only contribute to a better understanding of the basis for the neurological symptoms of GWI (the first step before new therapeutic targets can be identified and new treatments can be developed), but also a better understanding of the long-term toxicity of a class of chemicals that continues to pose a significant risk for military personnel as well as millions of civilians worldwide. Background: It has been hypothesized that a significant contributing factor to the cognitive dysfunction and other neurological symptoms reported in those who suffer from Gulf War Illness (GWI) may have been exposures to the class of chemicals known as organophosphates (OPs). However, there are confounding factors that limit the strength of this hypothesis (e.g., other environmental exposures, vaccinations, etc.). The proposed studies will determine prospectively in living animals if OP exposure is associated with pathological features (e.g., myelin-white matter anomalies) that have been observed in Veterans suffering from GWI. The proposed studies will also prospectively examine the effects of OPs on a process (axonal transport) that is fundamental to the function of neurons (i.e., effects that could theoretically explain the diverse neurological symptoms of GWI). Objective/Hypothesis: The objective of this application is to determine if exposure to OPs results in alterations in myelin (as observed in GWI patients) and axonal transport (as we have observed ex vivo in animals) in the living rodent brain. Our central hypothesis is that OPs compromise the integrity of myelin and impair axonal transport, effects that lead to functional impairment of neuronal pathways that support cognition and other neurological processes. We propose to study two OPs, a representative insecticide that was used in the first Gulf war, chlorpyrifos (CPF), and a representative nerve agent, diisopropylfluorophosphate (DFP). Specific Aims: (1) Determine the consequences of repeated subthreshold exposures (defined as doses not associated with signs of acute toxicity) to representative OPs on axonal transport in the living rat brain. (2) Determine the consequences of repeated subthreshold exposures to representative organophosphates on myelin in the living rat brain. Study Design: For Aim 1 we will determine if OP-related axonal transport deficits occur in vivo using manganese-enhanced magnetic resonance imaging (MEMRI) of the optic nerve axonal projections from the retina to the superior colliculus. To quantify Mn[2+] enhancement, manually drawn regions of interest (ROI) will be placed in 2D slices in various selected areas (eyeball, optic nerve, superior colliculus) along the Mn[2+]-enhanced and contralateral non-enhanced areas. The enhancement ratio within the ROI will be calculated by dividing the enhanced ROI intensity by the contralateral unenhanced ROI intensity. For Aim 2 we will use image-based segmentation of brain tissue as well as diffusion tensor imaging (DTI) to characterize changes in rat white matter (WM) after OP exposure. Segmentation of WM and grey matter (GM) and subsequent volumetric quantification of total WM, GM, and ventricular volume will offer a measure of gross tissue integrity. Fractional anisotropy (FA) and diffusivity along radial and axial directions of major neural bundles will provide three metrics for quantifying changes in myelin. These bundles and tracks will include the optic nerve, corpus callosum, corticospinal tracts, and additional regions that are known to be important for cognitive function (e.g., the fornix, and stria terminalis). DTI-based metrics (which provide an indirect probe of myelin alterations in vivo) will be interpreted in conjunction with Black Gold II histology and microscopic analysis (with unbiased stereology) of tissues from additional OP-treated animals. Quality assurance of DTI performance will be ensured using phantom objects with anisotropic diffusive characteristics imaged simultaneously during the rat imaging sessions. We will evaluate three doses of CPF (3.0, 10.0, 18.0 mg/kg) and DFP (0.125, 0.25, 0.50 mg/kg) + vehicle controls administered daily for 14 days. For MEMRI and DTI studies, six animals from each dose group will have baseline scans, will be re-scanned at the end of OP dosing, and then re-scanned again after a 4-week, OP-free washout period. Six additional animals from each dose group will be sacrificed for Black Gold histology at the end of dosing and an additional six animals will be sacrificed 4 weeks after the last OP exposure. Impact: The proposed studies have been designed to address the question of whether exposure to OPs was likely to have been a causal factor in the pathological abnormalities observed in sufferers of GWI. It is expected that the results will not only contribute to a better understanding of the basis for the neurological symptoms of GWI (the first step before new therapeutic targets can be identified and new treatments can be developed) but, also, a better understanding of the long-term toxicity of a class of chemicals that continues to pose a significant risk for military personnel as well as millions of civilians worldwide.